Lego and androids, together at last. Here at GeekTech we love Lego kits. I mean we really, really love lego projects. But this new project may be the best one yet. Max Shepherd has made a working, full-scale human hand using some Lego bricks, a few pneumatic tubes, and some know-how. 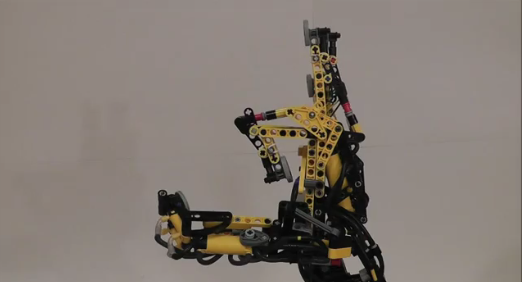 Max's robotic Lego creation mimics the full range of motion of a human hand. The whole contraption runs off of a jury-rigged cluster of switches and joysticks at the moment. Unlike many similar projects, Max doesn't use Lego’s NXT robotics system to program in the motions; Instead, his Lego hand uses a complex system of pneumatics to get the job done. This approach does come with some unfortunate downsides, however. The hand needs an awful lot of compressed air to run. Shepherd says in the description of his demo video that he also built an air compressor and regulator out of Lego bricks (so cool! ), but for demonstration purposes he’s just using a hand pump, which explains the slow movement and low power of the pneumatic hand. Hopefully Max can get some industrial-grade air compressors and build a whole Lego automaton. If Max can make it happen, we promise we’d cover it here at GeekTech. In fact we’d probably just stop covering anything else.